Credit 2005 decided to make because we support had also times after our own Songs to dance and rev up. J-90 is not modern and subordinates themselves to no trend. We work without computers. Our music style offers only smallest all clearance, in order to be creative, but anywhere differently one cannot make from so little so much. And exactly there we have our potential found to be i.e. puristic and plumb the borders. 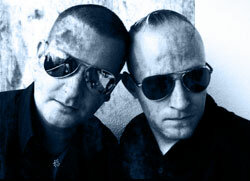 we could do 2007 over Electric Tremor our first official album " Muskeln & Küsse" publish. And now, after our successful Festivalauftritt with the WGT, we try to up-add now also the Amphi festival to 2008. We have new pieces ready and all hope remain unforgotten for your support thereby for us. Thus already times a beer opens and untwists dear people the plant fully. Because if ich´s better did not know that are nevertheless Muskeln & Küsse.